United Teachers Los Angeles, with the strong support of community groups like Reclaim Our Schools LA (ROSLA) has reached an agreement with LAUSD that ends their 6-day strike. Educators returned to work today. The strike was powerful for a number of reasons: the union used a Bargaining for the Common Good strategy, bringing parents and community members literally in to the negotiations and focusing their demands around a broad range of issues, well beyond wages. The educators did not want to resort to this kind of action. They had hoped that the district would negotiate in good faith. But with no fair and reasonable contract in sight, they voted overwhelmingly to strike. 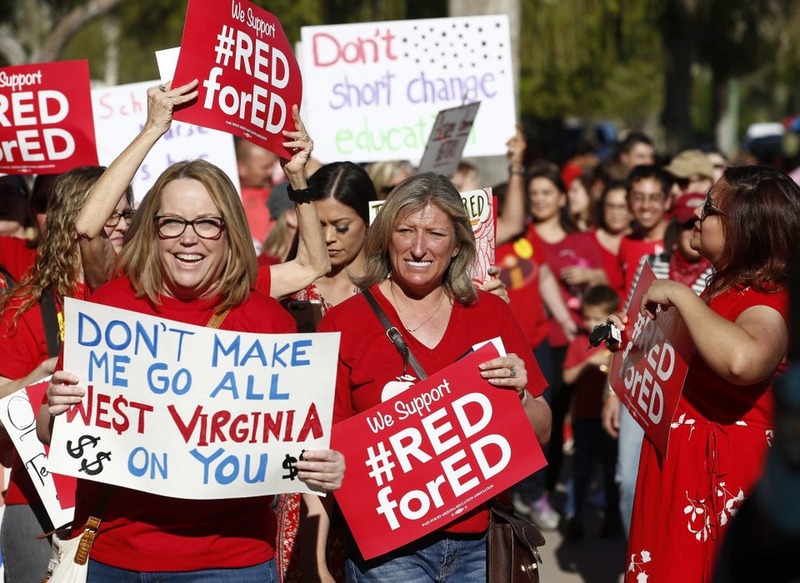 The strike, like the “Red For Ed” actions last spring in other states, was fundamentally about securing the investment to create the schools all children deserve. It was about smaller class sizes. It was about resources to make learning possible and more engaging. It was about dignified pay for educators and educational professionals. They also took on the city’s powerful charter school lobby, demanding a cap on charter growth and more accountability. And, they acknowledged the injustice of the district’s random search policy, which allowed police in schools to stop and search students without cause or warning. AROS provided support to ROSLA and the strike in a number of ways. One was the creation of a Solidarity Fund to support the activities of parents, students and educators during the strike. We are proud to announce that together we raised $169,000 through this fund. That money went in to providing childcare for thousands of activists at actions, and costs such as transportation to and from the many sites where protesters gathered during the week. Those actions proved critical. Students took the lead in a series of direct actions to help shine a spotlight on the players behind the district’s march towards privatization, including Eli Broad, The California Charter Schools Association, School Board Chair Monica Garcia and banker-turned-charter school operator William Siart. HERE is a short video montage of some of these actions. It’s a testament to the intrepid parents and students from ROSLA who joined the fight, in the rain, night after night. It’s also instructive to see how the education justice community in Los Angeles took on multiple targets and used the strike to education the public on the issues. Again, take a look at this short VIDEO, put together by the AFT. First, we must draw a line in the sand. On one side is investment in public schools, decent pay for education professionals, small class sizes, sustainable community schools, democratically-elected school boards and well-resourced schools. On the other side is privatization, over-crowded schools, divestment and police officers where there should be counselors and nurses. Pick a side. Secondly, we must build meaningful community/labor partnerships like ROSLA, which had an enormous influence this past week in LA. Next, investment in resources that make learning possible must be a defining issue for anyone who occupies public office, whether at the local, state or federal level. Finally, we learn that we must continue to put our bodies on the line through public action. These actions must disrupt and halt the status quo, as they did in LA! They must be planned in partnership with the entire community. They must be strategic, and they must be rooted in demands that change lives. 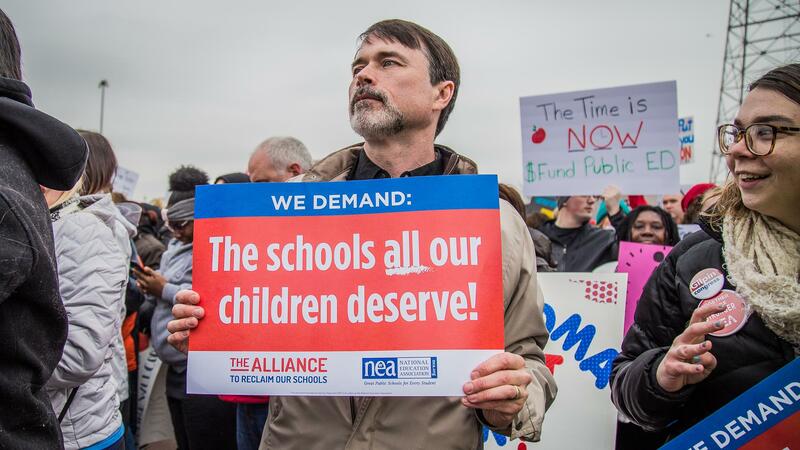 In the days to come, we must continue to demand the schools our students deserve. Indeed, teachers in Oakland, Denver and Richmond, Virginia are all taking action that could lead to strikes in the next several months. The public is with us. This is the moment to insert our bodies in places that force the wheels of this rigged system to stop working. We cannot be afraid to walk in, or walk out, or shut down. Too much is at stake. Over the next two years, as the 2020 elections loom larger, it is our moment to make sure that the next president understands that public education matters and commits to a new deal for all our children. The next Congress must be made up of folks who will not hide from activists but will stand on picket lines with us. The school boards we elect must be made up of folks who know that turning over our schools to the charter industry is unacceptable. And all who occupy seats of power must know that education professionals, parents and students are a united front. This is our moment and we will only accept the best for our children and their futures. More than 1,000 parents joined a tele-town hall on Wednesday night to hear details of the agreement. More details about the terms of the agreement can be found HERE. Washington Post covered the settlement HERE. 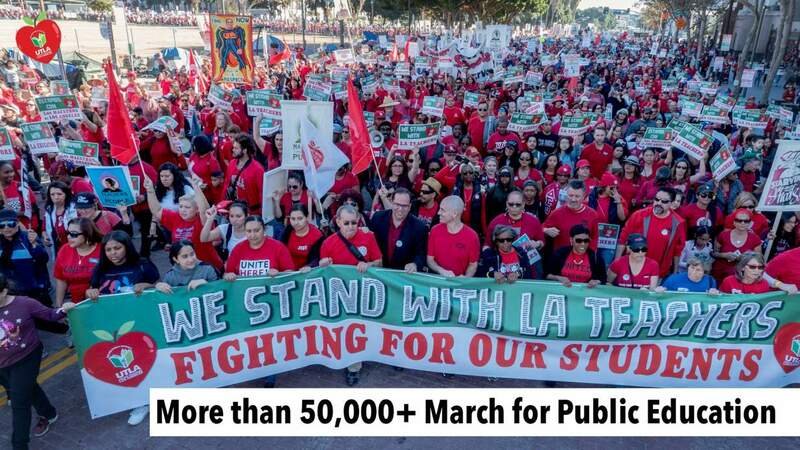 We offer our congratulations to UTLA, to ROSLA, to SEIU. To Students Deserve and all the organizations across Los Angeles who stood together. Thanks to all those who contributed to the Solidarity Fund, who flew to LA to join in the marches and actions. To all the teachers. All the parents. And all the students who supported the strike.